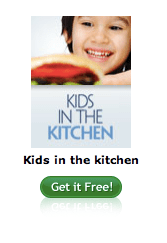 Answer a few quick questions and score your FREE Kids in the Kitchen Recipe Book. Your kids love to help when they can, and now there is a book just for them. Spend some quality time in the kitchen and have fun! Never too young to learn to cook.